By and large, people tend to be creatures of habit, specifically when it comes to stocking their garage with vehicles from a particular manufacturer. Sometimes when the habit gets out of hand, the seller needs to thin the herd, and today's seller is offering a trio of late '80s Fords for a decent price. Find them here: a 1987 Merkur XR4Ti for $6,900 CAD ($5,731 USD), a 1988 Ford Thunderbird Turbo Coupe for $7,200 CAD ($5,981), and 1990 Ford Taurus SHO for $7,000 CAD ($5,814 USD) all located in St John's Newfoundland, Canada via Kijiji.ca. Tips from Grumbling by Lotus. First up is this 1987 Merkur XR4Ti, complete with rally lights and a wicked custom paint job. Of course it has a 5-speed manual gearbox mated to its 2.3 liter turbocharged inline-4 rated at 175 horsepower, but this thing has been meticulously restored with $12,000 Canadian dollars invested. The seller advertises it as having show quality paint, like new interior and in exceptional condition. Even without the good exchange rate, this seems like a great buy. Next is the 1988 Ford Thunderbird Turbo Coupe, which was a magazine centerfold for Mustang360 magazine -- and it also looks really nice. The Thunderbird is powered by the same 2.3 liter Pinto-based inline-4, but it pushes out 190 horsepower and 240 ft-lbs of torque in the heavier T-bird chassis. 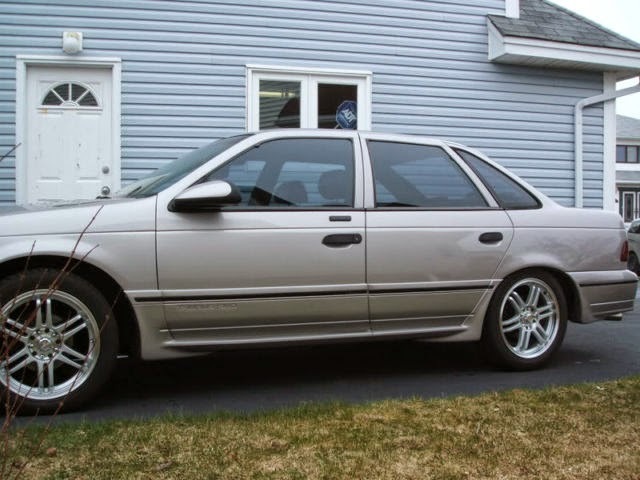 This is another car offered with a perfect interior, nice original silver paint, but it also features a number of modifications to make more power under the hood. Finally, we've got this 1990 Ford Taurus SHO, a great example of a car that is fun despite its specs, not because of them. A new EcoBoost SHO is a fun car to drive, but it feels like exciting than you'd expect from a 300 horsepower twin-turbo sedan, probably because it is only available with a slushbox and has more road hugging weight than a Mac truck. The first generation SHO is a fun car to drive and you forget that it only puts 220 horsepower into the front wheels. This one is another excellent condition car with limited issues, but it does have a few more miles on the clock. I need a collection of loosely associated stream-of-consciousness posts for my DT experience to be truly complete. Actually, I know where Stan is. I sold him a 90% rust free triumph stag for $690 but told him that he had to pick it up in Irvine. Since K2 is in hibernation (he won't come out till he sees his own shadow, which is difficult in a volcano lair), I will post this video to make your DT viewing experience truly, truly, complete. Stan by your man. Between tidying up the volcano lair, running the transgender underground railroad and pondering Stan's fate at the hands of the torch and pitchfork crowd -I mean- angry DTers (my money's on the folks with the fire and the pointy objects), I got no time for you people and your shenanigans. I can only muster enough energy to barely talk about cars in the most boring, pedantic way possible. Fortunately, the post main copy continues to be entertaining and enlightening. So here goes, my big contribution regarding this particular post...Canadian dude's got some Fords for sale, eh? Is a one post Stan like a one night Stan? The XR4Ti - okay, they're interesting, but I'm not at all a fan of the noisy, rattly, shakes-itself-apart 2.3. This reminds me mainly that the Euro-market Sierra Sapphire with the REAL turbo Pinto - the 2-liter Cosworth YB - is now past the 25-year NHTSA window, and THAT's tempting. The SHO - it's a good start. Every SHO not Oxford White suffered peeling clearcoat sometime between two (black parked outdoors, BTDT) and four years from new. SHO Shop can and horn fine, shame it doesn't have the rest of the 'bolt-on stage' or even stage-1 cams as Vadim was one of the few aftermarket vendors to be halfway honest about his HP claims even if he was notorious for being a little 'optimistic' (I won't say 'fraudulent' because I know what small aftermarket vendors are dealing with re suppliers) re shipping dates. The optimal real-world SHO, should you want one, still needs a Quaife ($1500+install), a Gen 3 front subframe and rack, and Cobra brakes. I hear you on the YBT. However, when the Lima (Note I did not say Limey!) 2.3T is set-up right it is a joy to drive. If you look at the mods done to the engine on the T-Bird, that is exactly what a Lima 2.3T needs. Click on the car ad and then click on "view map". Next click on the "--" to back out the map view and see the location. Wow that would be a great adventure picking up one of those cars! Well, mrkwong, I have basically no idea what you just said (although I'm glad Rene seems to) but the bit about the Sierra Sapphire + Cosworth caught my attention. Do you have a link to more info on such a beast? I'm working an angle for better access to that sort of exotica. 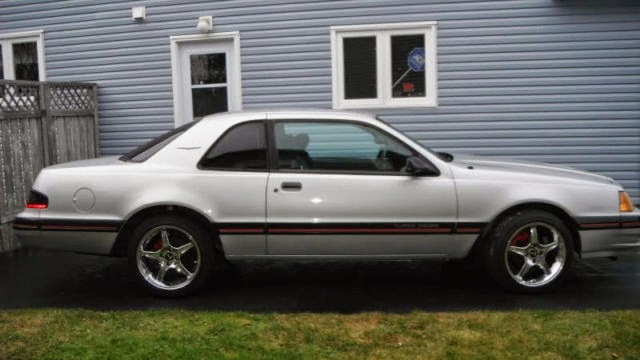 Hmmm, the Targa Newfoundland is coming up in a few months (Sept 13 thru 18th) and that Merkur would do the trick nicely, if you want to have some fun dodging Newfies on one lane Macadam roads. It even comes with spares and unchipped paint.